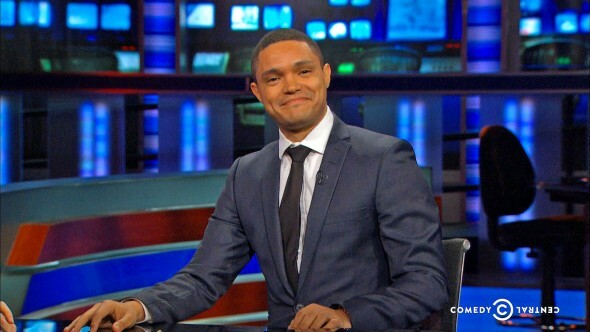 Comedy Central has announced that Trevor Noah’s version of The Daily Show will kick off on September 28th. Jon Stewart will sign off on August 6th. Trevor Noah starts his new job in September. Until then, he’s getting comfortable in Jon’s chair. What do you think? Is Noah a good choice? Will you give the new show a try? More about: The Daily Show with Jon Stewart, The Daily Show with Jon Stewart: canceled or renewed?, The Daily Show with Trevor Noah, The Daily Show with Trevor Noah: canceled or renewed? I will miss Jon and have been a fan for years but have watch Trevor’s comedy show and he is funny. He does not use filth or offensive language. He is smart and articulate. He speaks many languages and is up on currant affairs. I believe he is a good choice and I am looking forward to watching him. I am still disappointed that Jon Stewart is leaving. Hopeful Trevor’s format will provide similar political news. I can’t figure why there such a long pause between when Stewart leaves and when he starts. Just like with Cobert taking the Dave Letterman spot. Do they think we need a mourning period or something? I’m sure there will be changes, but hopefully they won’t be so big that it’s a totally different show. If politics lost this great satire then all we’d have left is just the awful reality of politics…..Who wants that world? Hello! I will never watch the show again with this Trevor Noah what a terrible mistake. Good bye!!! PS I will miss you Jon! !